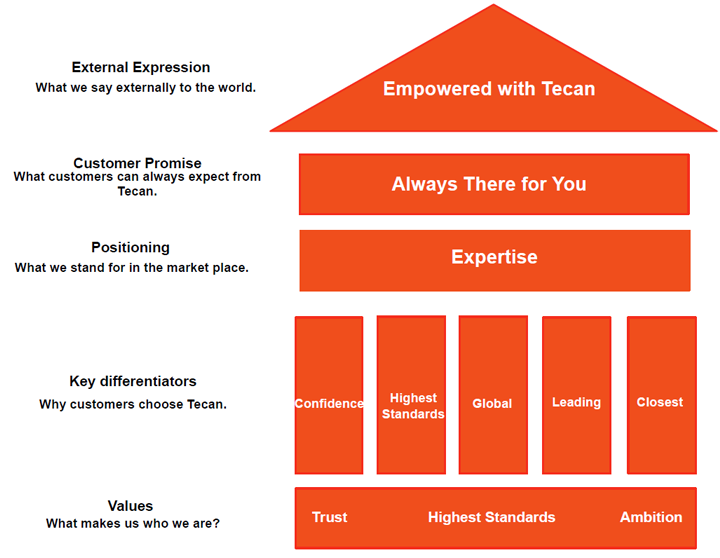 Our values – trust, highest standards and ambition – are the cornerstones of our business, and give us the framework for the Tecan culture. We foster a positive and empowering environment, which allows us to bring our passion and energy to work. This helps us to deliver on our customer promise – ‘Always there for you’. Get a feeling of this through our employee insights. Trust gives everyone in Tecan the freedom, power and responsibility to contribute to the success of our business and reach the highest standards. This ambition to make Tecan special pairs innovation with discipline, ensuring that ‘we say what we do, and we do what we say’. Our Brand House defines how we position ourselves internally and externally. It guides us in our communications, behaviors and interactions. Our promise – ‘Always there for you’ – means that we maintain a sharp focus on our internal and external customers in everything we do – being there for them when they need us. We go out of our way to inspire trust by maintaining close contact, listening carefully and always responding in a positive manner. Do you want to be a part of this culture? See our open positions. Tecan culture is made and shaped by our people. A crucial element of this is the way we communicate. We therefore work continuously on our communication, focusing on courage, curiosity, respect and brutal honesty. By living our values every day – everywhere and with everyone – we create the open, trusting and inspiring environment that makes Tecan special. We aim to hire and develop strong, skillful and energetic individuals, building powerful and successful teams empowered with Tecan. We evaluate and identify internal talents to create and develop a talent and succession pipeline. We focus continuously on our culture, discussing, challenging, empowering and taking actions to improve our way of collaboration. We build our company strategy on future skill and competency requirements, creating external networks with experts and institutions to make working for Tecan an exciting experience and attract the best talents. We invest in the development and education of our employees by providing a highly adaptive learning environment that keeps pace with the ambitious requirements and expectations of our business. We offer a broad spectrum of internal and external training opportunities to support our employees and enable them to grow professionally, upholding our reputation for expertise.